Description: NO MAGAZINE SALES into NEW YORK CITY. CONNECTICUT residents must furnish us a copy of your CT Eligibility Permit or ammunition certificate. This listing is for ONE Magazine. Buy 3 ships free: buy any 3 lots non gun non ammo and shipping is free! Here are 10 round the Beretta model 84 Cheetah series pistols chambered in .380 caliber, and manufactured beginning in 1980. Manufacturer is Mec-Gar s.r.l., of Gardone, Italy. Importer and warrantor is Mec-Gar USA of Middletown, CT. Mec-Gar product number is MGPB8410B. 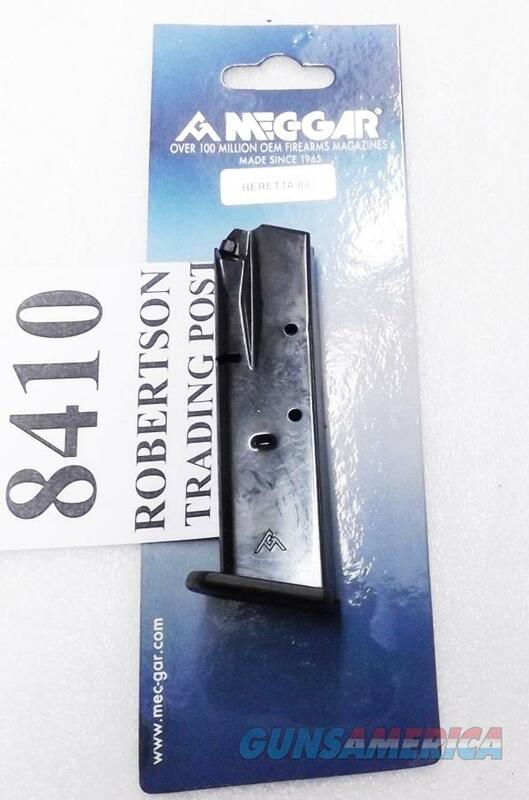 Type is compliant double stacked pistol magazine. Construction is one piece, dimpled, folded steel body with two position left side round count port, and full welded, smooth milled back. Inner plate is steel; spring is music wire one piece. Cartridge follower and floor plate are black polymer. The lateral dimples ensure that this magazine cannot be modified. Finish is polished surface blued steel. Each magazine holds 10 rounds of .380 ACP caliber ammunition. That is three fewer rounds than the standard MGPB8413B magazine. We normally have the high capacity 13 rounders in stock, and the price is a bit lower on them. This magazine is for any variant of the Beretta model 84 pistol. It does not matter whether a Beretta 84 has a BB suffix on its model number, or an FS Suffix, or the word Cheetah written on it. It will also fit a Browning BDA380 pistol, because Beretta manufactured the Brownings. It will fit the Girsan Chiappa copy of the 84 made in Turkey. It will not fit any other pistol besides an 84 Beretta, the Girsan copy, or a BDA380 Browning. Each magazine comes in its factory package. Replacement pricing on compliant 84 magazines from Beretta’s online store is $48.00. We’re offering these Mec-Gars each, however,	for only	$ 23.00. Not for sale to residents of New York City. $3 Lower 48 First Class Mail Padded Envelope; $10 Priority to AK HI PR. First Class sometimes requires removing the item from its package.